Additionally, MTPPI has announced that the Dialysis Patient Citizens (DPC) Education Center has agreed to serve as an Engagement Partner for the PRAIKCO National Symposium weekend. The DPC Education Center will use its powerful social communication network to increase awareness of the National Symposium within the Dialysis Patient community, with a focus on reaching patients affected by renal anemia. 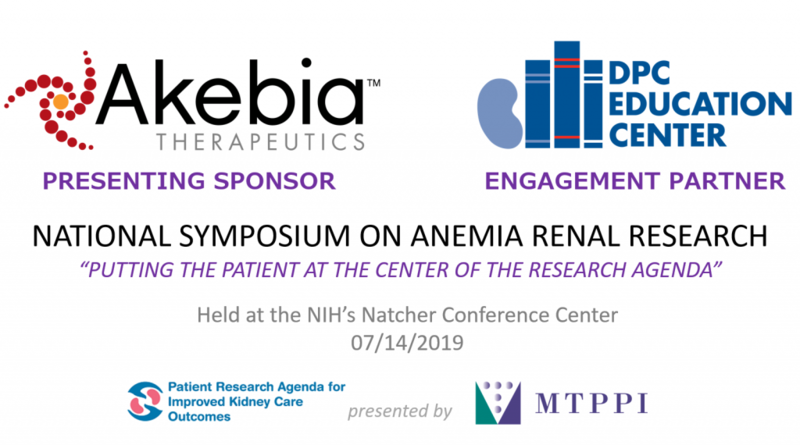 DPC Education Center staff members will also be active participants and session leaders during the Symposium weekend, driving engagement between the patient community and stakeholders involved in furthering renal anemia research efforts. About the Patient Research Agenda for Improved Kidney Care Outcomes (PRAIKCO) National Symposium: The National Symposium weekend ( www.RenalAnemiaResearch.org ) is the culmination of a two-year long initiative led by the Medical Technology and Practice Patterns Institute. The goal of the Symposium weekend is to compile an integrated list of research priorities and potential strategies to improve dialysis care in real-world, clinical settings. Attendees will give recommendations for research questions while working towards consensus on priority topics, research design considerations, data collection strategies, reporting and dissemination channels, anemia management policy making opportunities, and patient education strategies. Final deliverables will be used to inform future research, policy, and clinical practice. About the Medical Technology and Practice Patterns Institute, Inc. (MTPPI): Medical Technology and Practice Patterns Institute (MTPPI – mtppi.org) is a nonprofit organization established in 1986 to conduct research on the clinical and economic implications of health care technologies. MTPPI’s research is directed toward the formulation and implementation of local and national health care policies. With extensive investigator experience in both the public and private sectors, MTPPI’s staff designs, implements, and conducts a full range of healthcare research and technology development activities. Our staff includes statisticians, epidemiologists, economists, programmers, biomedical engineers, and policy analysts. We specialize in using big data to conduct “real-time”, “real-world” studies that are both affordable and useful for healthcare stakeholders. About Akebia Therapeutics, Inc.: Akebia, a biopharmaceutical company, focuses on the development and commercialization of novel therapeutics for patients with renal disease through hypoxia-inducible factor (HIF) biology. Its lead product candidate is vadadustat, an oral therapy, which is in Phase III development for the treatment of anemia due to chronic kidney disease in dialysis and non-dialysis patients. The company is also developing a HIF-based portfolio of product candidates, such as AKB-5169, a preclinical compound for the treatment of inflammatory bowel disease. Akebia Therapeutics, Inc. has collaboration agreements with Otsuka Pharmaceutical Co. Ltd. for the development and commercialization of vadadustat in the United States, European Union, Russia, China, Australia, Canada, the Middle East, and other countries; and Mitsubishi Tanabe Pharma Corporation for the development and commercialization of vadadustat in Japan and other Asian countries, as well as research and license agreement with Janssen Pharmaceutica NV for the development and commercialization of HIF-prolyl hydroxylases-targeted compounds internationally. The company was founded in 2007 and is headquartered in Cambridge, Massachusetts – https://akebia.com/.